Hurtigruten has announced the purchase of a new expedition ship. The ship, temporarily named MS Norway Explorer, was built in Portugal in 2009 at the Viana do Castelo shipyard*, and is now making her way to Scandinavia. After she undergoes a total reconstruction including adapting for polar waters; upgrading the cabins, suites and public spaces for the 320 guests; and adjusting the power plants and emissions so as to meet Hurtigruten’s high standards, the ship will join the fleet along the Norwegian Coastal Voyage route. Fitting well into the company’s planned expansion to offer more expeditions, the new ship will replace the Midnatsol, which will join the MS Fram in Antarctica for the 2016/17 season. A leader in exploration travel, 123-year-old Hurtigruten is continuing to expand its marketing and sales efforts in North America as it invests in its future. Having been taken private late in 2014, the company is gearing up to offer new itineraries, an array of new soft and hard adventure excursions and expansion of its highly regarded expedition leader teams over the next few years. * Editor notes: This vessel was previously known as "Atlantida" (IMO 9434060) and has already had an interesting history. 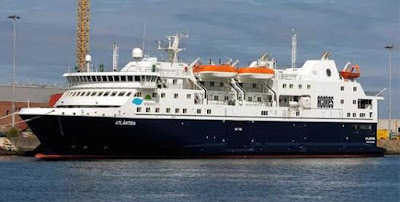 According to a report in TradeWinds, Atlantida was first ordered in 2006 by Atlantico Line, a ferry company owned by the Azores regional government. The ship, contracted at EUR 50m, was completed in 2009 but Atlantico refused to take delivery, claiming its speed was one knot short of what was stipulated in the contract. Atlantico’s refusal to take delivery played a large part in the Portuguese shipyard's subsequent bankruptcy. Since then the yard, which has been under administration supervised by Portugal’s defence ministry, had been trying to sell the ship.